I'M A PDF-LEVEL BACKER, BUT WANT NIFTY ADD-ONS! Don't fret! PDF-level backers (ANARCHIC ACOLYTE, GHASTLY GHOUL, TERRIBLE TCHO-TCHO) can still pick up nifty items from our curiosity. Add a base of $5 plus $1 for each add-on to your pledge, and send us a note via the "contact us" button on the right side of the screen by our picture and let us know what you're adding on. We will also ask about it in our survey at the end of the kickstarter. EEEK! I DON'T UNDERSTAND SHIPPING! Anyone who knew us when we were still figuring out how kickstarter works with Horror on the Orient Express knows that the shipping can be confusing. We have tried to streamline our shipping in order to make the process simpler. The shipping for each tier is listed in the particular's tier description. We ask for you to add the appropriate amount of shipping listed, plus $1 per physical item in your order. For example, if you're living in Germany and you want the DANK DEEP-ONE level plus two t-shirts, you add the amount for the level ($40) plus shipping for that tier ($20) plus one buck for each book ($1), plus one buck for each t-shirt ($2), giving you the grand total of $93. HOW MANY BOOKS ARE THERE?! 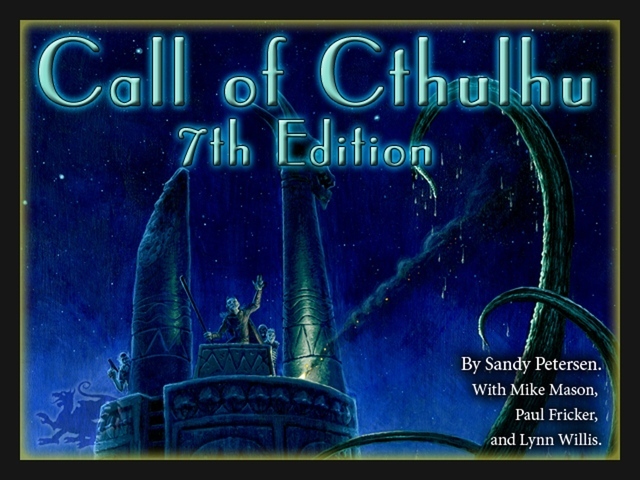 CALL OF CTHULHU 7TH EDITION consists of two books: the Keeper's Core Rulebook and the Player's Handbook. All the game system rules are in the Keepers Core Rulebook (inc. character generation). The Investigator Handbook is not necessary for running the game. The Investigator Handbook contains rules for character generation (inc. further optionality and more occupations, plus specific player advice etc). The Investigator Handbook is specifically for players and does not contain the game system rules. WHAT SHIRT SIZES WILL YOU OFFER? We can accommodate any shirt size. We will send a questionnaire in the survey at the end of the Kickstarter. WILL ALL LEVELS GET THEIR NAME IN THE BOOK? I've chosen a pledge level. Can I upgrade the books I receive with it? We want to make it easy for you to get the books that you want. To do this purely through pledge levels we'd have to offer a confusing myriad of additional pledge levels. Instead of that we're offering you the option to upgrade your books. If you've chosen one of the higher pledge levels (such as Diabolical Dark Young) and wish to receive a more expensive level of book than the one stated on that pledge level you may do so by increasing your pledged amount and letting us know exactly what you want. We'll list the possible options along with the extra cost below. DIABOLICAL DARK YOUNG UPGRADE: you automatically receive everything on the SLOBBERING SHOGGOTH pledge level. If you wish to receive the leatherette Book set instead (as offered for the pledge level NICTITATING NYARLATHOTEP) add $233 to your pledge (that's simply the difference in cost between SLOBBERING SHOGGOTH and NICTITATING NYARLATHOTEP). You would then get the game at Gencon plus one leatherette deluxe Investigator Handbook and one leatherette Keeper's Rulebook (along with the other extras). If you want a combination of pledge level and books that we haven't listed, please tell us and we'll list it below. I'M A PDF-LEVEL BACKER, BUT WANT NIFTY ADD-ONS! EEEK! I DON'T UNDERSTAND SHIPPING! HOW MANY BOOKS ARE THERE?! WHAT SHIRT SIZES WILL YOU OFFER? WILL ALL LEVELS GET THEIR NAME IN THE BOOK? I've chosen a pledge level. Can I upgrade the books I receive with it? I want to know when my reward is shipping. I am having trouble filling out my survey. I would like to make a change to my pledge. I would like help with preorders. I have a issue with my pledge finances. I have a question for the project creator. I have a question not listed here. I want a refund for my initial campaign pledge. I have a question about BackerKit.